As I have expounded before, when it comes to the real estate industry the subject of money is little discussed and little understood. I have sought to answer the often asked questions as to what are the real estate commissions charged by the large companies? what does a real estate agent earn? and also just how efficient is the real estate industry? To add to this list I have for quite sometime been meaning to do an analysis to see exactly where that c.$18,000 of commission fees goes when the property transaction goes unconditional and the selling agent collects the deposit from the buyer from which they are entitled to deduct their fees. In the calendar year 2013 the 80,119 property sales reported through the Real Estate Institute’s members generated a total sales value of $40 billion and a commission fee of $1.4 billion in residential real estate alone. The question I think should be asked and investigated as to the flow of this revenue stream as to who are the beneficiaries. I make the statement of beneficiaries not as a judgement in any way on any party to the real estate service, I merely believe it is insightful to see the flow of money. Firstly the $1.4 billion in commission fees actually scales up to $1.6 billion when the GST is added, meaning that the average amount property sellers paid to real estate agents was just over $20,500. As far as following the money the first beneficiary is the government - a tidy $200 million a year of GST on the transaction invoice comes right off the top the government. In fact when you add up the total tax take including GST plus notional PAYE and company tax I would conservatively say that the government coffers benefit to the tune of $400 million a year from the operation of the real estate industry. This total conveniently matches the total budget for the Ministry for Culture & Heritage with a 2013 budget of $398 million - seems somewhat fitting that the real estate industry effectively under-rights Arts & Music, Broadcasting & Films, Sport & Recreation and Heritage. This significant take by the government however only represents just under a quarter of every dollar that sellers pay to real estate companies, the balance - 76% or in total $1.2 billion is distributed as represented in the chart below. The largest chunk - a total of $610 million representing $37 in every $100 paid by sellers goes to the people who provide the services to the sellers of property - the agents or more appropriately titled licensed salespeople. There are around 10,000 of them in residential sales. So the reality is that agents see only just over a third of the total money paid by the seller. Somewhat surprisingly only $7 of every $100 that vendors pays in fees goes to the marketing of their property (or in fact marketing in general as this total of just over $100 million includes the real estate companies and agents own brand marketing) - given the desire by sellers to see the property sold which as a natural precursor requires a marketing campaign, it may comes as a surprise just how little of their money is spent on marketing. A large portion, $27 in every $100 paid by property sellers goes to the business owners who run the real estate industry, not for those flash high street offices as this cost is separately accounted for as $5 in every $100; but to the structures and operations that support the individual real estate agents whilst they are out and about prospecting for business and negotiating the sale. Notes: These calculations are based on the starting point of the sales data from the Real Estate Institute, to this I have added published data from some individual real estate companies (Barfoot & Thompson and Ray White) together with market share analysis of the market to create a model of the sales value by company. I have then factored in the average commission split between salespeople and offices as well as commission rates recognising regional variances and factors for median price. Lastly I have estimated the franchise fees charged by the groups based on market intelligence I have acquired over the many years I have worked in the industry. I accept that there is a lot of estimation in these calculations but as an indication I believe them to be robust enough to publish. I admire and respect Barfoot & Thompson for many reasons, but most of all because they take a professional and open approach to data. On their site they publish facts. 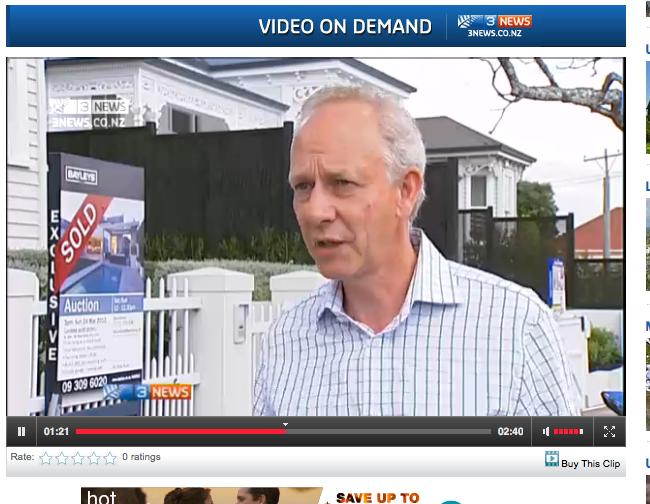 They share valuable insight into the property market. 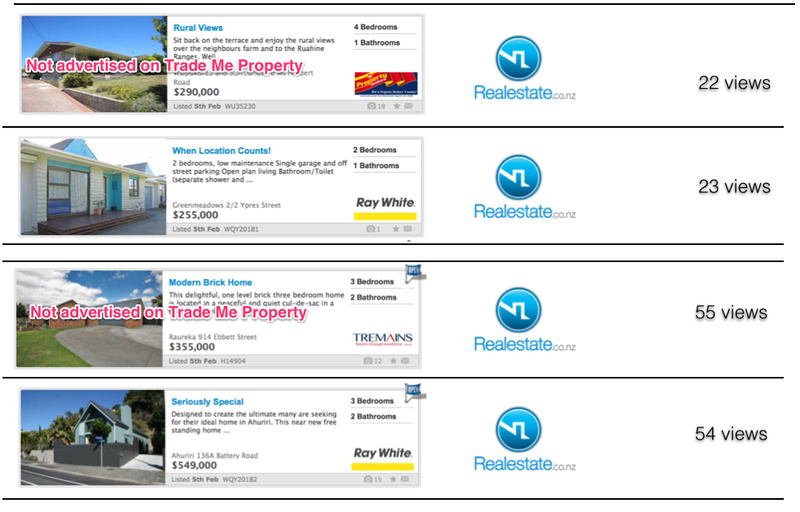 You can easily see how many properties they sold in a month, by price range, type and location. They also provide rental data as one of the leading property management companies. This insight into their business should be celebrated, not so much for what it says about the company, as what it does to help us better understand the property market in Auckland - the powerhouse of the NZ economy and the hotbed of discussion of the property market. Their ability to share openly their sales performance is a lot to do I suspect, with the family ownership; thereby allowing the directors to make the decisions that they believe are in the best interests of their employees, their self-employed real estate agent contractors and their wider community, as well of course of their business. The Barfoot & Thompson business is huge. 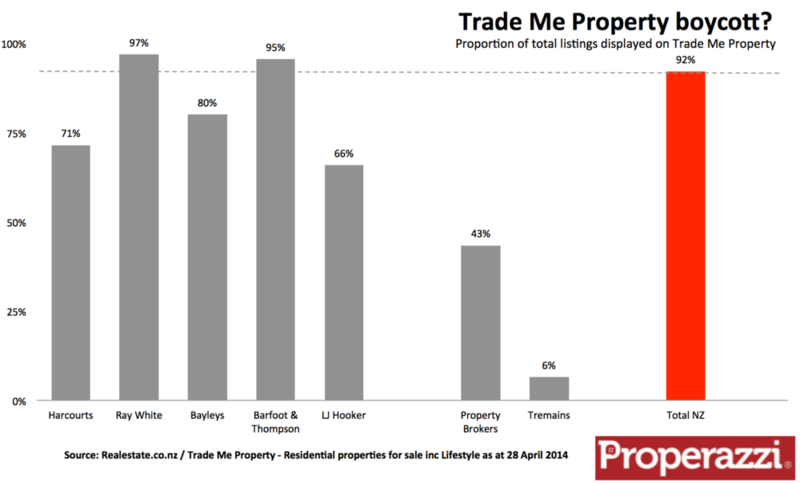 In 2013 they sold around 4 in every 10 properties in Auckland. A total of 13,123 transactions with a total transaction value of $8.5 billion. 2014 has so far been an even better year for them with sales in March exceeding a value of $1 billion in a month - a record very quietly celebrated internally I am sure, a staggering success. In March their total sales of 1,392 properties equated to 19% of all properties sold in NZ and they only operate in Auckland! 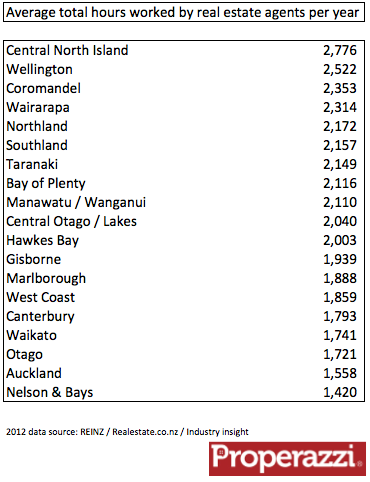 (& Northland) although their data is based on Auckland. Their success over the past couple of years is a testament to a classic marketing strategy I remember hearing in my early years in marketing. Increase your marketing investment in the downturn period of the economic cycle - just when your competitors are retrenching to save costs and secure shareholder dividends, that is when the smart company invests. As the economy improves as it has done in the past 3 years, then your investment pays off as your brand is well established with strong emotional triggers to ride the economy upwards. Barfoot & Thompson are experts at emotional triggers being passionate supporters in the community - whether it be sporting, the arts, charities and of course their support of Starship - they wear their heart on their sleeve and back it up with resources to invest back into the community. Their business model is smart - do what other competitors do, but makes your presence felt. They charge a commission rate just less than the competitors - not so much to be seen as a discounter but enough to provide a point of difference and a sense of being with the community. They invest in their physical presence. They have more offices than any other brand in the region - over 60 offices, so there is a presence on every high street in the region. They invest in people and they support them, offering salaried apprenticeship scheme to get people into the industry. They invest in brand marketing - you don't have to travel far to see a billboard or the back of a bus to get that recall of the brand. All this investment is paying off, their market share in the Auckland market is growing, topping 46% in March alone to deliver a 12 month average of 42% up from 38% coming out of the recession in 2011. Almost all of this growth undertaken without buying up other franchise operations or building new offices (bar a very few exceptions) very much unlike how their competitors operate. Barfoot & Thompson also deliver higher metrics than the other franchise groups in the country based on a per office or per agent basis. They achieve almost twice the rate of sales per office per annum as their main competitors and deliver a higher gross transaction value per agent. They are also innovative being the only real estate company to release an iPad app in NZ - an app that in my opinion is the best user experience for property viewing of any of the apps on the app store at this time - its only weakness being the range of listings, limited to just their own! Returning to my opening remarks, the thing I most admire from the company is their publication of data, at a time when we need greater insight into the property market to assist us to make better informed decisions as to the state and trends in the market I am pleased we have such a forward thinking company in our leading city. The largest real estate company in Auckland, Barfoot & Thompson published their most recent sales report for the last month of December capping off what has been a stellar year for the company. Whilst December witnessed a slowing of sales with just 817 properties sold down from the 920 sold in the December last year the company accounted for sales of 13,123 properties in the past 12 months a growth of 12% amounting to an extra 1,413 sales compared to 2012. Set against a total of 31,782 properties sold in Auckland in the past year this gives Barfoot & Thompson a market share of 41% - 2 of every 5 homes sold in Auckland was sold by them in the past year. The key statistic though is the shear scale of transaction value - $8.5 billion of property sales undertaken by the company, an increase of 24% on the prior year. The company currently is selling properties at the rate of over 6 properties every hour of the working week and billing services at the rate of around $100,000 every hour of the working week. 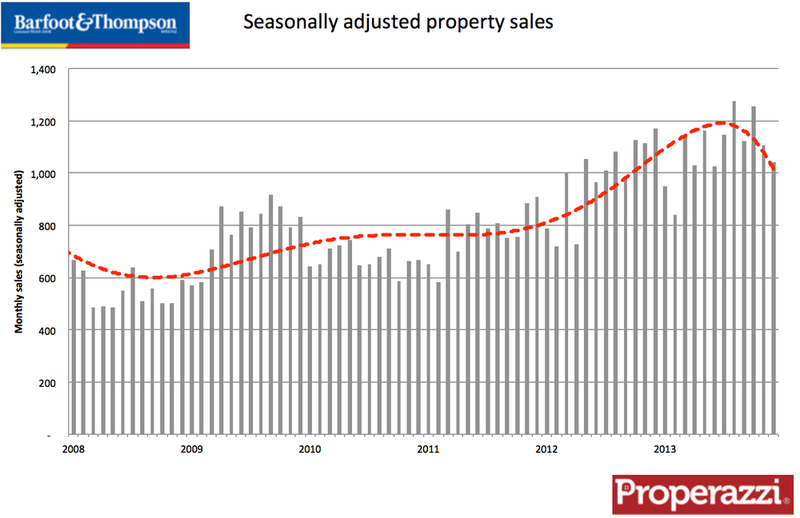 The company has benefited from the significant resurgence of the property market in Auckland selling more than twice as many properties in 2013 than in 2008 at the depth of the property collapse. in dollar terms the value of sales have risen faster especially over the past 3 years with value of sales up 68% in just 2 years. The stellar rise in sales volumes though does show signs of slowing as analysis of the past few months shows. On a seasonally adjusted basis December sales were down 6% following a 12% seasonally adjusted sales volume fall in November. As cited last month part of the reason for the fall could well be put down to the impact on the first time buyer segment as a result of the Reserve Bank restrictions on high LVR lending. 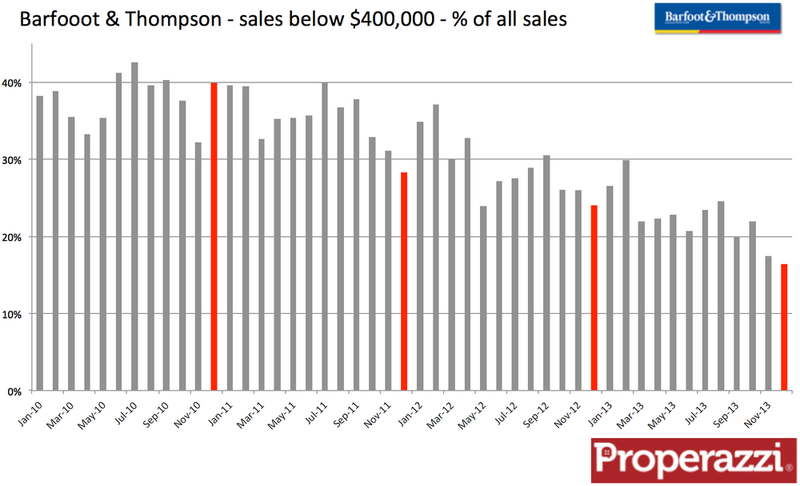 The latest analysis of the sales volume by price segment of Barfoot & Thompson sales data shows that this bottom segment - sub $400k which is very much a target market for first time buyers remains a declining proportion of Barfoot &Thompson’s portfolio of sales. In November it represented 17% - a month later it had fallen to 16%. A year ago this segment accounted for nearly 1 in 4 of all sales, such has been the slide in activity in this segment of the market. This movement between price segments has been a trend witnessed across all property sales over the past 4 years as the market demands of property in the Auckland region have accelerated prices and fuelled higher priced segments. In the past year alone Barfoot & Thompson has sold over 1,500 properties at a price of over $1,000,000 , this compares to 500 just 3 years ago and in the $2,000,000 and above segment sales in 2013 totalled 176 properties compared to just 52, 3 years ago - that is going from selling 1 per week to selling 3 per week. Three years ago the largest segment of sales representing 2 in every 5 properties sold by Barfoot & Thompson were at a price of less than $400,000; whereas today that largest segment is represented by property priced between $600,000 and $1 million which represents 1 in 3 of all sales, whereas property below $400,000 has slipped to less than 1 in 4 of all sales. Clearly the Auckland market continues to show strong demand and appreciating prices - in December Barfoot and Thompson reported that the average price for all property sold in the month has exceeded $700,000 for the first time ever. That growth is not likely to be arrested any time soon given the signals of economic growth and vibrancy of the Auckland economy in the coming year. If you start seeing more late model European cars parked outside open homes in the coming weeks – don’t be surprised. Simply put; in the past 20 years there has never been a better time to be a real estate agent. It is the perfect alignment of the key drivers of the real estate industry. Sales volume are growing fast, prices are up and up, there’s little competition in the commission fees and its harder to break into the industry. Since the peak of the property bubble in late 2007, sales volumes fell by 40% and then rose by 40%, prices fell 8% and the rebounded 23% whilst the number of agents literally halved but have barely grown since 2010. The industry structure was significantly altered in 2008 with the implementation of the Real Estate Agents Act. The new Act required a higher threshold for admission plus annual license renewal by individuals whereas prior to the new Act licenses for salespeople were held by offices on behalf of offices, allowing for a more flexible arrangements for people to move into and out of the industry. As the property market collapsed in the 2008 / 2009 agents left the industry as selling opportunities lessened. When the market started to recover in 2011 the traditional surge of new entrants to the industry did not eventuate as the barrier to entry had been raised by higher entrance requirements, an effective apprenticeship period and less educational establishments providing courses. In the 12 months to September of this year the industry comprising just over 9,000 active residential agents, (as tracked by Realestate.co.nz) closed 80,539 sales with a combined value of $39.35 billion. The value of the commission charged by the industry to their clients for their services in the past 12 months to the end of September totalled an eye popping $1,586,450,000 (inc GST). That total is within 5% of the all time record set in 2007, yet back then the industry had over 17,000 agents vying for the opportunity to sell property. Viewing this data on the chart below ably demonstrates just how happy those in the real estate industry must be at this time. In the past 12 months the average agent has sold 9 properties and has generated an average commission total of $153,280 (exc GST) charged to their clients for their services. Of course the agent themselves will see a proportion of this commission dependent up on the arrangements with their office. However the fact is that this scale of sales commission has grown by more than 50% in just 2 years driven by the rise in volume of sales and rising prices. The majority of this growth though as is so often commented is unique to Auckland and Christchurch so maybe the real winners will be European car dealerships in these key cities! The analysis I recently undertook to ascertain the average earnings of real estate agents certainly provoked some interesting response when published in the NZ Herald. Clearly the quoted contributors to the article did not have to hand an accurate sense of what an average agent earned in Auckland or any other part of the country. There only comment was that “Auckland agents would be on higher (earnings)” or “if agents were not making enough .. they would move”. You would have thought that an industry employing over 9,000 active salespeople together with over 1,500 support people in over 1,000 offices across the country accounting for a gross sales value of services in excess of $1 billion would know how much people earn on average. The fact is the real estate industry does not analyse this kind of data. It does not care about this data or worry as to the efficiency of the industry at large or the many thousands of agents within the industry. An industry that pays an average of just over $43,000 a year to its front line representatives for what is a serious and complex process involving hundreds of thousands, if not millions of dollars I judge should be concerned. The fact is the real estate industry is massively inefficient. There are just too many agents tripping over each other, fighting one another, stabbing each other in the back to get a listing and from there to conclude a sale and ultimately earn a commission. That commission is very alluring – the median house price in NZ last month was $382,000, the average commission charged by real estate companies to sell a house of this value is around $16,000 + Gst. The listings agent will receive on average between 50% and 60% of the commission charged to the vendor – that’s around $9,000. So if you could list and sell just one property a month then you could earn $100,000+ per annum! Just one property a month. That would seem to a lot of people a simple task, 22 working days to find a property and sell it. The fact is that on average each agent in NZ sold only 8 properties in the whole of 2012. So in theory they could take 4 months off and sell a single property a month for 8 months and earn $72,000. How can this be – the numbers don’t seem right! The numbers are right, but only make sense when you look into the workload of an average real estate agent. I have spoken to quite a few agents to ascertain the time component of their work and what I have found did not surprise me, but may come as a surprise to many. Just shy of two thirds of the working time of real estate agents (64%) is spent prospecting for new work. The productive time spent on behalf of their clients in facilitating the sale of a house represents less than 25% of their working week. Yet their income from vendors supports their full working week. This is where the inefficiency shows itself – 9,300 agents spending nearly two thirds of their working week prospecting for future work. A massive 230,000 hours of working time each week spent by the industry to list just 2,300 properties. That means that the industry collectively spends 100 hours a week prospecting for every listing. The bizarre thing is that a single listing that collectively the industry spent 100 hours chasing was going to happen anyway. That vendor wanted to put their house on the market. The industry just fought tooth-and-nail to get that listing, or at least one agent beat the others to it. There has to be a better solution. Technology should be able to play a better part in the process. Vendors want to sell, they want the best agent that knows the market for their type of property in their area – there must be a better way of evaluating agents and allowing them to pitch their proposal. Agents must want to be more efficient. However a more efficient real estate industry would be a massively smaller industry. If a more efficient process could be implemented to allow a vendor to choose an agent, it is likely that the amount of time each agent spent on average securing a new client per week could drop from the current 25 hours to around 8 hours. This would then free up time to provide more service to more clients, each agent then handling far more clients. A result of this would likely be a reduction of the number of real estate agents from the current 9,300 to around 1,500. But then the issue arises as to the commission payable; because if the same commissions were charged and the industry only needed 1,500 agents then they would earn on average over $250,000 a year! This is where the hypothesis falls down because the real estate industry does not want to change. The industry, for that read the real estate companies; want the inefficiency, they want to have agents fighting each other for listings and earning an average earnings of $43,000 a year. The industry protects the model and the consumer pays - heavily! This article and full analysis was featured on TV3 News on Saturday 6th April - the reporter spoke to some buyers who recognised the value of having an assistance in selecting an agent and thereby helping agents become more efficient. 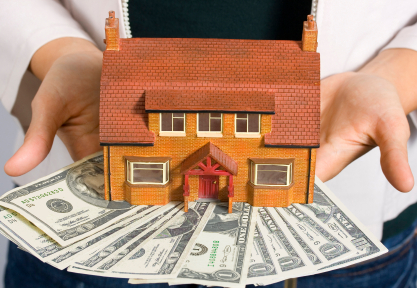 How much does a real estate agent earn? This question usually generates a variety of responses – “vast amounts of money based on the late model cars they drive!” or “must be easy money as anyone seems to be able to be an agent” to the more knowledgeable “it’s tough, those at the top earn fortunes, whilst the majority need to a second income”. The fact is real estate in average is not the highest paying career, but you can make it become a very high paying career – its up to you. There are agents albeit a small number that earn in excess of $1m a year, many more earn over $100,000 however as with any industry the majority don’t! Enough of the subjective assessment. I have undertaken a detailed analysis of the real estate industry in NZ during 2012 to come up with a series of insightful analyses of the industry. Using public information from the Real Estate Institute and generally available information from a number of websites as well as information gleaned from discussions with real estate agents I have come up with information on agent average earnings across the country. In 2012 the industry was paid in commission fees by sellers over $1 billion (inc GST). The industry supported just over 9,300 active agents. That though did not result in each agent earning $100,000 – the income from commission does support quite a considerable infrastructure before it is divided up amongst the selling agents. In 2012 the average income for an agent in NZ was $43,372. As a function of this, the top earning agents are naturally in the top prices areas of the country with interestingly Wellington taking out the top spot with an income of just under $94,000, compared to Auckland at $76,000. Part of the reason behind this is the fact that there actually less agents per property sale in Wellington. 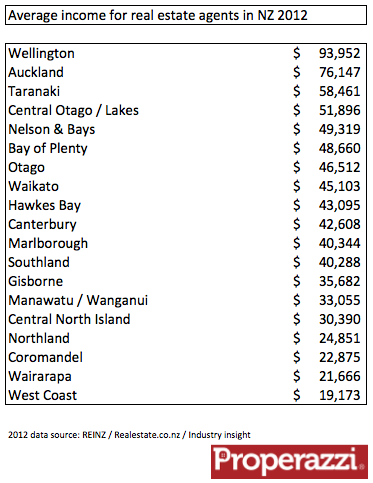 Interesting to see the Taranaki grab the 3rd place spot at $58,000 ahead of Central Otago, which of course benefits from Queenstown prices to deliver an income of just under $52,000. The next 9 regions all have income above $40,000. The bottom 4 regions though struggle to deliver a reasonable income; all below $25,000 with the West Coast delivering the lowest income of just below $20,000 – barely a quarter of the income of Wellington agents. 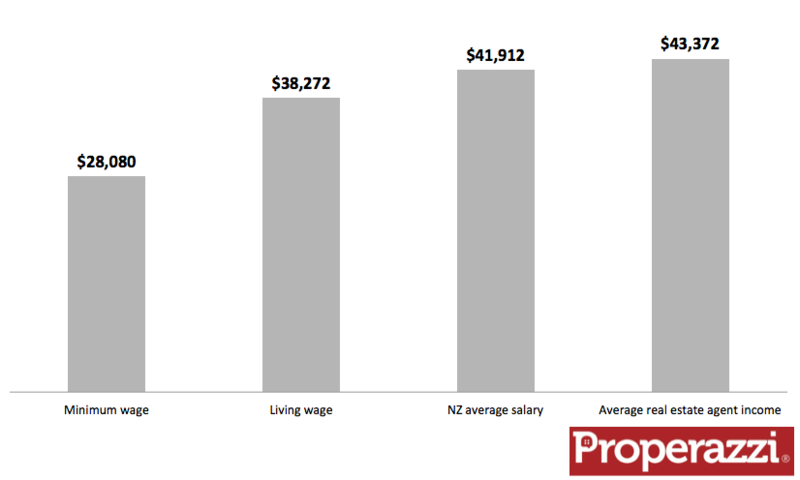 It is important to be aware before you judge these incomes against the median NZ salary of $42,000 that this is gross income. As self-employed contractors agents have to support their business before they can regard this as take home pay. Costs include their REAA license, compulsory training, the necessary car and travel costs as well as marketing. Conservatively this is likely to be around $10,000 a year. Making an adjustment for the tax offset of these costs the equivalent annual average salary of a real estate agent in NZ would be around $35,000 which is interestingly below the recently championed “living wage” of $38,000 (18.40 per hour). Where is the best place to be a real estate agent? If Wellington agents earn the top income in the country at over $90,000 then the answer is simple – go work in Wellington! Not quite, the fact is that real estate is not a 9-to-5; Monday to Friday work for which you receive an identical monthly bank credit. Real estate is a self employment option and as with any sole trader business, the more you work the more you should be able to earn. Whilst we all know this adage is logical but not always right, the fact is people in real estate tend to work longer hours than your average employee. Taking extensive information from the real estate industry together with insight gained from my role in the industry over the past 6 years I have for 2012 tried to examine the workload of agents around the country to see who are the most productive, who work the longest hours and how do these factors effect the true hourly rate of real estate agents. I have examined the workload on the basis of the number of sales managed by agents matched to the data for average days on the market. The number of new listings matched to time spent prospecting for business and finally the available inventory on the market during the year and the associated workload in supporting those clients. Add the usual self- management time and office time and I have come up with a total hours per agent per region. 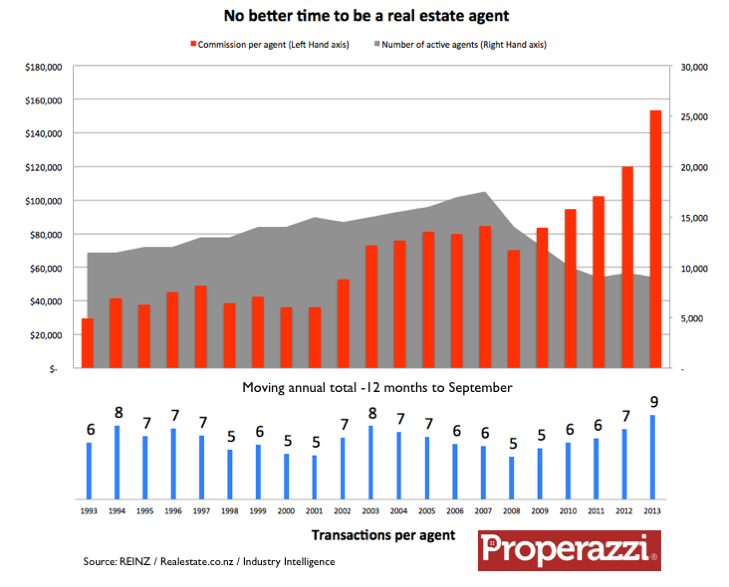 The average annual workload of an agent in NZ is 2,033 hours. This compares to a traditional employee working 9 to 5, 5 days a week with holidays and stat days working 1,840 hours. Agents work 5% longer in a year than most employees. Across the regions the scale of the workload is incredible. The most industrious agents are in the Central North Island they on average work 2,775 hours per year. At the other extreme the agents in Nelson seem to have it made; appearing to work a total of just 1,420 hours. This measure of workload is only really meaningful when evaluated as an effective hourly rate given the diversity of regional incomes as presented in the analysis of how much an agent in NZ earns. The conclusion is that the best place to work in real estate in NZ would by this measure of effective hourly rate appear to be in Auckland where agents work an average of 1,557 hours per year for an effective hourly income of $48.88. Closely following on the heels of Auckland is Wellington and Nelson. Eight of the 19 regions have an effective rate in excess of $25 per hour, or put another way, the majority of regions have an effective income at an hourly rate below $25 per hour. Alarming is probably the fact that 5 regions have an effective hourly rate below the minimum wage of $12 an hour with agents in the Wairarapa working an average of 2,314 hours per year for an effective hourly rate of $9.36. Again as mentioned in prior analysis these incomes are gross and have to support business costs, which have been estimated at around $10,000 per annum. When casually asking people recently how much they would expect to pay real estate agents to sell their home, I was surprised to find a variety of answers. I should point out I was looking for numbers as answers, not just the predictable answer of "too much"! I was equally surprised when the article on the influx of agents into the industry recently quoted a commission range from 3.5% to 5% of the sale price. So I set out to seek to get some facts on agent commissions. What I found was that no company charges 5% - but the fees charged do vary significantly. Most agencies seem to charge around 4% on the first $300,000 of the sale price and then around 2% on the balance with often an admin charge and of course GST applicable to all commission charges. What I found most surprising though is just how difficult it is to find out what companies charge via their websites. As I stated the commission charged and presented in this chart for the other groups is sourced from the Mike Pero website, as each of the other companies do not provide a commission structure online then it is not possible to separately validate those commission fees. The blue bars represent the commission charged by each company for a property sold at the current median price across NZ (REINZ Stratified price $385,275) with the red bars representing commission payable on the current price across Auckland (REINZ Stratified price $547,375) . All commission charges include GST. These commissions are expressed as $ amounts as is now required by the Real Estate Agents Authority who stipulate that a listing agent must provide you with an estimate in dollar terms of the commission you would have to pay if your property sold at the appraised price. The commissions are surprisingly variable with a range at the NZ national sales price from just over $13,600 to $18,300 and in the case of Auckland sales price from just over $17,300 to nearly $25,000. It is valuable to put these commissions into perspective when you consider the appreciation or lack of it of property prices across the country over the past 5 years. In that time period since August 2007 the average NZ house as measured using the REINZ stratified median price, has gone from $377,425 to $385,275 - an increase of just $7,850, the commission on the sale of that house today would be swallow up all of that appreciation. In the case of an Auckland property which at the stratified mean price, has risen from $510,400 to $547,375 - an increase of $45,975, then in this case the commission would be covered by the appreciation but could consume more than half of it. Now before I get a barrage of comments from those within the industry I thought for the sake of completeness that I would also highlight some alternative operators which are all licensed real estate companies who charge very different rates. 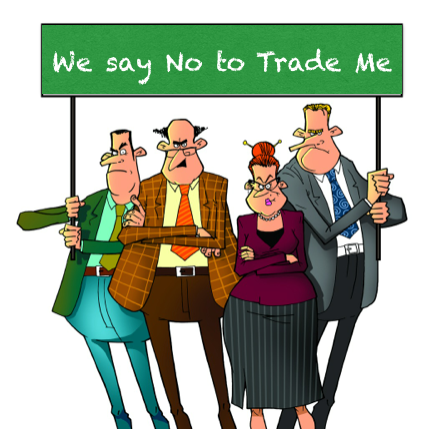 In Auckland The Property Market charges 2% - a flat commission irrespective of the sale price. This is by no means an exhaustive list of alternative providers of services in the real estate market, I just happen to know of these companies and felt the need to include their details. I do not at this stage propose to analyse their services save for to highlight their consistent focus to the role of online in the process of marketing property for sale.